Trouble with the Curve is a hunk of homespun hokum pointedly designed as the anti-Moneyball, where the geezer scouts cast out of the temple by Brad Pitt’s Billy Beane find redemption back in the bleacher seats. It’s a baseball picture framed within minor league parks and high school diamonds, where Sabermetrics can’t calculate that a batter’s hands drift on a breaking ball and a computer can’t process that the only thing a struggling prospect needs to break out of slump is a visit from mama. But while the film succeeds in painting a Rockwellian portrait of the national pastime, its plot proves as old-fashioned as its cultural viewpoint. 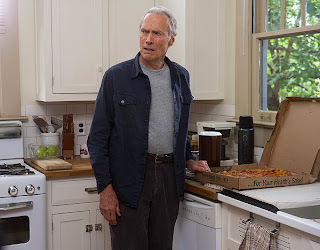 As aging, erasable baseball scout Gus Lobel, Clint Eastwood doesn’t lecture empty chairs, but he does have trouble with tripping over them due to failing eyesight that’s pushing Gus’ increasingly unproductive career towards retirement. So, his sassy daughter Mickey—as in Mantle (Amy Adams)—postpones her partnership track in an Atlanta mega law firm to join her widower dad, to his chagrin, for an important assignment scouting a cocky, hard-hitting prospect in Western North Carolina. Along the way, Mickey harbors hopes of healing their strained relationship. Eastwood and Adams’ whip smart interplay carries the film, embracing the oft overlooked father-daughter sports bond. And no one can grouse a line like Clint, who’s essentially playing a variation on Walt Kowalski, his last on-screen role in Gran Torino. However, Mickey’s dalliance with a former flamethrower turned Red Sox scout (Justin Timberlake) lacks authenticity. It’s just part of writer Randy Brown’s safe script, capped by a lazy, overly tidy final act that erases any semblance of narrative nuance and transforms the film from simple to simplistic. Just when Trouble with the Curve could use some high heat, it serves up slow pitch softballs.